The task requires that we select from one of the topics of this course, and create a map from the list of keywords for the topic provided by Matthias. Matthias took the keywords from the synopsis for each topic written by Stephen Downes. The task is to connect and annotate the keywords. Matthias provided links to two types of mapping tool – cmap.ihmc.us and a tool he has created himself – http://condensr.de/download-page/ . I have used both tools in the past, but I am more familiar with Matthias’ tool, so I used that. 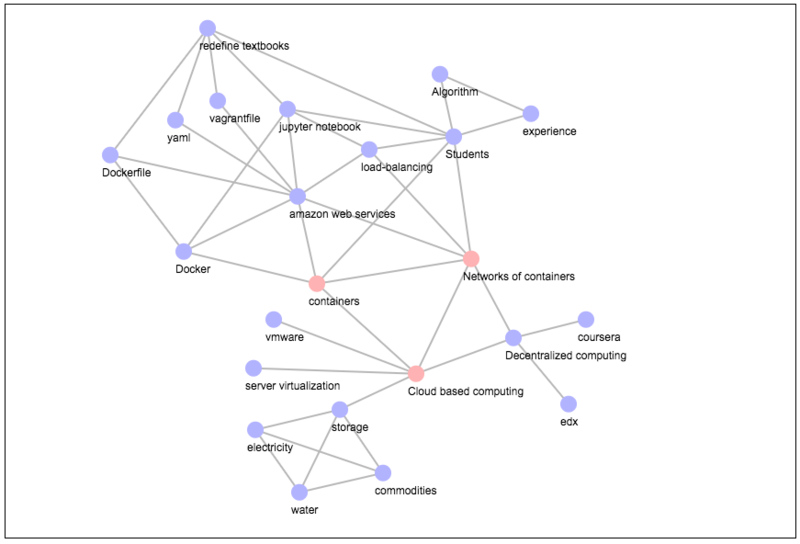 I selected the ‘Cloud’ list of keywords, to create this map. Since I have used this tool before (see A new mapping tool: useful for research purposes) I did not find it technically difficult. Here is a screenshot of the map I created. Click on the image to enlarge it. I created the map using the text from Stephen’s synopsis. This revealed the aspects of the topic that I still haven’t understood. I made a note of these in the text annotations (in italics). I did look up definitions and explanations of some terms and added text if an explanation wasn’t evident in Stephen’s text, e.g. algorithm. If I were to continue to develop the map, I would do more of this. The graph, properly constructed, is not merely a knowledge repository, but a perceptual system that draws on the individual experiences and contributions of each node. This informs not only what we learn, but how we learn. To develop my knowledge of the Cloud, to learn and understand more about it, I need to grow my connections and the links between them. The state of my knowledge can then be represented by the map. A key affordance of Matthias’ Think Tool is that it is easy to ‘grow’ the map, adding nodes and links, and storing information about them, as this growth occurs. The source of truth, if there is any, lies in how those links are created and maintained ….. and that …. it’s not the individual idea that’s important, but rather how the entire graph grows and develops. It protects us from categorization errors and helps prevent things like confirmation bias. This links to what Matthias says, at the beginning of his video, about the dangers of pigeon-holing things. These ideas go beyond what Matthias asked for in his task, but I do see that in order to start thinking of knowledge as a graph, we probably need to start by creating graphs, and his Think Tool helps to make the shift from thinking of knowledge as a representational system to thinking of knowledge as a perceptual system.